I've been spending a bit of time improving the board design worksheet that I'm using to produce the board outline and the rocker jigs. I've added in some very basic modelling of the flex profile based on the beam bending theory in the FGI DIAB Sandwich handbook. As you would expect modelling it properly is extremely complex and, like all good engineering problems, by approximating the hell out of it you can get pretty charts with numbers on them but really need experiments to calibrate the many constants and error terms that appear in the analysis. The modelling I did was very basic. It modelled the board as a beam witha thin rectangular cross-section (i.e no concave) with uniform thickness laminate. The elastic modulus of the core is negligible compared to that of glass/resin and the rails have been assumed to be wrapped (although the shear strength of ABS probably makes this ok'ish). The core elastic modulus condition is probably ok for foam and lighter balsa but not for any more dense wood. The calcs do take into account the actual width of the board and thickness profile that can be either a step or flat in the middle with tapered ends, the number of layers and strength of the laminate. Also the applied bending forces can be set at either a point force at the tip or a uniformly distributed load. I googled around to try to get some of the material properties for the different materials used and found some properties that seem about average. To do this well you'd ideally determine them by experiment. Of course the real divergence between the theoretical values and the actual values is in a big part driven by the influence of the actual quality of the construction. There's no way to model a crap job of removing air bubbles or resin that doesn't stick to the core because of greasy finger prints. All this does make the exercise of limited value in calculating the absolute values of the flex profile but where it does come in very useful is to determine the relative values for different core profiles, board shapes, layers and distribution of glass to look at the effect on the flex. Even better will the case when I've made a few boards using the tools and both calibrate the model and potentially generate some really values to compare with. So here is the output for the parameters for the last board I made. 3layers of 6 oz glass each side, step profile core ( 2 layers of 6mm klegecell) , 24 " stance , no tip thinning. 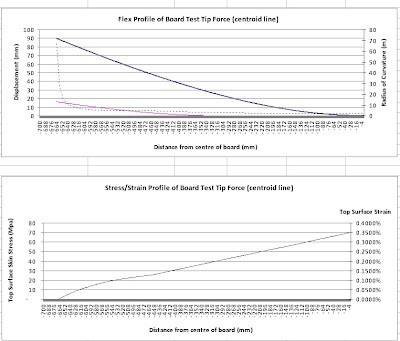 The top chart shows the flex profile under a 40kg load applied only to the tip of the board. The solid lines show the profile of the board when the board it clamped at the center and then at center of the footpad. The deflection (does not include rocker) that results. The dotted line shows that radius of curvature at each point along the board - bigger equals flatter. 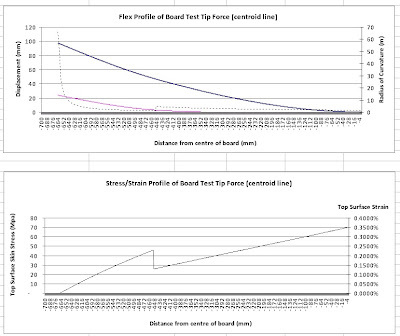 By way of comparison, I changed the profile to have the thickness of the core tapper from the 12mm midsection down to tips at 6mm and you can see from the first plot below that the stiffness of the tips flex about 20% less. This seems intuitively right. The strain is mislabelled and should be teh strain of the underside of the baord.